Now first things first. I don’t want to get into a big thing here on definitions, so let’s say we just confine this list to non-organic heroes. That rules out cyborgs, but leaves androids and robots in play. All clear? Then let’s roll. The 80’s action icon that has aged extremely well. There is still nothing quite like the idea of an intelligent, self-driving, well-armed muscle car. It still draws people today, as a blend of automotive and robotic awesomeness. Inexplicable powers (weather manipulation? how does that work?) and an altogether respectable costume design makes for a fine android. Remarkably, he actually brought something unique to the League, as well. His weather powers complimented the raw strength and speed of Superman/Wonder Woman/Flash quite well. He’s made a ton of appearances (he’s currently on Young Justice), and has some pretty dovoted fans. 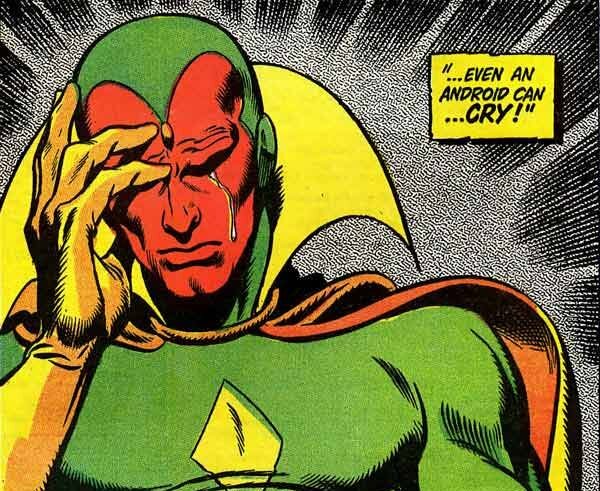 The Justice League has Martian Manhunter, and The Avengers have Vision. A highly sophisticated AI and android body, he has phasing powers, psychic powers, strength, speed, and a nice color scheme (in the non-white version). There’s a good rundown of the character right here. No one really gets you when you’re the Spartan soldier. Being humanity’s only hope against not one but two interplanetary hordes of marauding bloodthirsty beasts means that people look at you with a ton of expectation. They put you on a pedestal. You are not merely a person to them; you are a champion, a hero. So it’s nice when someone just talks to you like you’re normal. And it definitely helps if they’re also really handy at guiding you along the mission. Enter Cortana, the A.I. lady who puts herself on the line repeatedly for the sake of the mission (seriously, if I’m A.I. I ain’t putting my main programming anywhere NEAR the frontline) and the best friend and confidante to Master Chief. When she goes missing, the game becomes about retrieving her first, saving the universe second, and if you see it any other way you’re fooling yourself. And yeah, she has devoted fans on the cosplay circuit. There is only one name in modular robotic video game heroes. And it is two names. He was created as Rockman in Japan (as in “this guy rocks”) but changed to Megaman for the American release. But a helper-bot turned champion by any other name saves the world just as well. Megaman’s been going strong ever since his pretty-damn-tough original games, right through to his new retro throwback platformers. There is some discussion as to whether or not he is cybernetic, and thus has organic components. But according to my research, Rock was always a robot (becoming a Robot Master) even though he looked human.